I wish you could come to the UAE. I wish you could come and walk through the museums that show the photos of what this barren land looked like only 70 years ago and try to fathom how that could possibly be as you stare out at the skyscrapers and mass development. In the 1940’s and 50’s this tiny pocket of the Arabian desert was pretty quiet and its people were struggling to survive after the collapse of the pearling industry. Life was hard and simple and the Bedouin people did what they could to carve out a life for themselves in the desert. And then, in 1958, they discovered oil. During my experience preparing for the Women’s Heritage Walk, I saw a video named “In the Blink of an Eye,” which showed the landscape of the UAE and its rapid transformation in such a very short time. It is the perfect title to express what Emiratis in their 60’s and 70’s have seen in their lifetime. But countries aren’t the only thing that change in the blink of an eye. Lives change that quickly too. Especially in the UAE where over 80% of the population is made up of expats living here on work visas that can come and go as unexpectedly as pearls and oil. On Friday morning we were at church, only 17 days away from our departure date for Prague where we planned our 6 week European vacation. I was thinking about the case studies I need to complete for my course before we leave and about a birthday sleepover Abby was having that night to celebrate her 10th birthday with her friends before everyone went their separate ways for the summer. We had finished our homeschool work for the year and I was percolating on the changes we have been dreaming about for our learning life this fall. Then we arrived home from church and Dwayne received an email from ADEC saying that his teaching contract was not being renewed. Dwayne and I spent the afternoon struggling to process the implications of this news and trying to hold ourselves together enough to prepare for Abby’s party. We decided not to tell the kids until the next day when the party was over. My hands were literally shaking as I iced Abby’s cake and I kept going to my room to cry. We had a lot of questions. We had to make a lot of decisions. And we had to act quickly because when your contract is not renewed, your visa is done, and you have to leave the country. We were not prepared for this. And we didn’t want this. Remember? I wrote about how we wrestled with the decision of whether to stay another year back in the spring, and we felt great peace about the decision to stay one more year. Peace and joy. We had much we were looking forward to. And we had plans for our return to Canada that were going to be possible because of one more year here. Suddenly it felt like everything we’d been dreaming about for our life was just wiped out. ADEC is going through big changes and making cuts. The rumours are out there. Everyone around here knows a random person or two whose contract was not renewed this year and they are all baffled. When your initial 2 year contract is up with ADEC, your principal and vice-principal send in a recommendation for you to stay or go, and if they say stay, and you haven’t resigned, it seems that generally, you stay. Dwayne didn’t resign. His principal and VP recommended he stay on. But the decision was made in head office to cut some jobs. One of them was Dwayne’s. There are thousands of open positions in private schools around the UAE. We considered whether or not Dwayne should apply for some of those. If he was able to get one of those jobs, the hours are a lot longer, the pay is less, and he’d have to sign a 2-3 year contract. Plus, we’d have to cancel our visas and go through the new visa process this fall and move to a new apartment. If you’ve never lived in the middle east, you may think those parts are no big deal, but trust me, the whole process of moving our internet service to a new apartment in this country would be enough to make me run for the hills. Everything is a big deal. And we knew in our hearts we only wanted one more year, not two or three. So, on Saturday we told our kids. They were equally shocked and devastated. The four of us cuddled on our couch and cried. The same spot we sat and cried many times less than two years ago when we were struggling to adjust to life here. We sobbed over leaving when we so wanted to stay. We cried about the friends we’d made and the home we’d created and the city we loved. This felt different from our other losses because we’d chosen those things ourselves. This one was thrust upon us. On Sunday Dwayne spoke with EMT support and learned that this decision was out of their hands as it came from the top. His admin at his school tried to help, but it was out of their hands too. So, after a weekend of praying and crying and questioning and agonizing, the four of us found ourselves sitting quietly on our bed. We’d explained our options to the kids. Abby was the first to say it. Josiah said the same. Dwayne and I looked at each other. In my heart I knew I didn’t want to put my family through all that again, only to move to Canada next year. We both agreed. This news meant it was time to go. I have to confess, I’ve been a Christian for 20 years and this was the first time I’d ever wondered if God was real. It was fleeting, but I said to Dwayne, “Is God even real?” We had spent months seeking God on the decision of whether to stay or go. And we had felt such peace about the decision to stay. And such affirmation from people in our life. We felt divinely led. The support we received from our Al Ain community in the first couple of days after receiving this news quite possibly saved my faith. I can’t even see the screen now through my tears, but I don’t know how to fully explain to you how painful this has been. But God, in his wisdom, placed us in community because he knows that life is too hard to journey alone. I received at least 30 different messages with verses, promises of God, and prophetic words from the Lord that bolstered me in a very difficult time. Many more have come since then. Nothing trite. Just real. They spoke to all the things my heart was feeling. They ALL spoke to me so powerfully, but I want to share just two with you. First, one of my friends, who didn’t know the details of our situation yet, said life in Al Ain sometimes reminds her of the Israelites, when they were in the desert, and how God literally led them with a cloud by day and fire by night. When the cloud would settle in one spot, they would set up camp and stay there. Sometimes the cloud only stayed for one night, sometimes for weeks, sometimes for months. They never knew how long they would be in one spot. 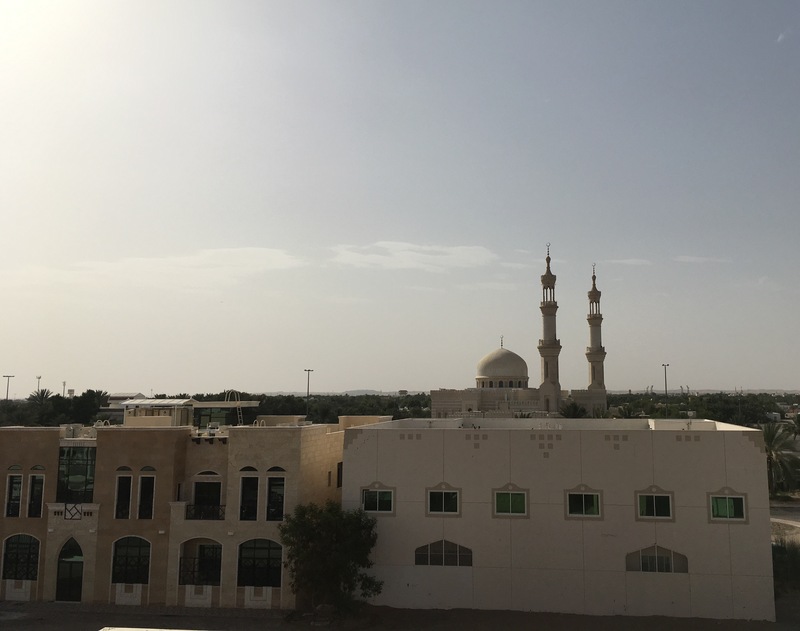 It may sound strange to you if you’ve never lived here, but truly, some times you wake up one morning in Al Ain and the cloud is moving and you weren’t expecting it, and it’s time to move on. This is how we felt as a family. We could have fought to find a way to stay longer, and it’s quite possible that would have worked out. But we truly sensed the cloud of God’s presence was moving us, sooner than we’d expected, but definitely moving. And then this. On Saturday my prayer group leader sent me a message saying that someone in our group had a word from God for me on Tuesday night. She had believed this word was for me, but I was already gone and she didn’t have my number, so she texted it to him. He had not yet sent it to me, but he thought it might be a good time for me to hear it. She said she sensed that a storm was going to come up in my life and I should remember I am with Jesus in the boat. In the boat I ask Jesus if he cares and if it’s going to be alright. And Jesus says he will take care of it. Three days before we received this news, God sent a message of comfort through a friend to remind me that though I doubt him momentarily, he is with me and he is taking care of me. He is real. He is in control. He is a good, good Father. He has our best in mind. We don’t see the whole, big picture, but he does. Life changes in the blink of an eye, but I know my Father never stops watching over me. Oh Jen, even though we’ve never met, your posts have always resonated with me, and I ache for you all the same. We, too have once had moving thrust upon us in ways we questioned (and yes, visas that were ending), and I admit struggling with the very same question of ‘does God really care?’ when we came home penniless, jobless, homeless, and with a very ill child who remained ill for a very long time. You have some very wise friends God has used to speak to you through with gentle words of comfort and support. What a perfect picture your friend has given you of the Israelites moving on as the cloud moved on. And yes, Jesus is indeed there in the boat with you, though some days it may feel so rocky you don’t feel him holding you, but he’s there. You write so well, and have given all of us this true picture of your beautiful life with your beautiful family in the UAE. Thank you for this. We will add you to our prayer list this morning as you look for guidance now for what’s next. Hugs go out to you from our house to yours. Your words brought me to tears. It’s going to be sad to lose such a great family, but I too believe that God always has a plan for us. One day you will look back on this moment and say, “that’s what you were telling me God!” Our family has been so blessed to have been touched by your family, even for just a brief moment. All the best to you guys on your next adventure. This is hard, but it will make sense soon. In the blink of an eye, our dreams of moving to the UAE were ended by similar cuts. I’m still reeling from the blow. But I know God has a plan and I look forward to it becoming clear. Best of luck to you and your family! Keep supporting each other! Found this post through the Read the World book club – what upheaval you/your family is experiencing! I pray that God will smooth the way forward for you all (And it seems, what with the encouragement you are receiving, that He will). Thank you as well for sharing that insight about God’s presence in the cloud – how the Israelites never knew how long the cloud would stay in one place. So poignant and true! Reminds me that the only place God wants me to be is with Him. May we all stay close! Thank you for your prayers and encouragement, Sara. We have seen God’s hand in all of this.